This test must be performed in order to identify cross contaminated cell lines. The use of misidentified cell lines can result in false results if the tests are performed with no pure cells. Mycoplasma cell culture contamination is one of the major problems as mycoplasmas can produce different effects on cells with modifications of function and activities. Contamination can derive from different sources such as animal reagents (foetal bovine serum, trypsin), tissue origin and operator. Different techniques can be used to detect mycoplasma contamination and they are indicated in the following table. Cell cultures and biological resources collected in a biobank must be checked for different parameters that can allow to evaluate their purity towards different pathogens including adventitious viruses. Virus contamination in cell cultures can be evaluated by tests based on molecular biology assays that allow to detect viral DNA and RNA. In alternative virus isolation can be performed on susceptible cell cultures and detection by direct and indirect methods. Serial amplification of cell cultures can result in genetic modification with a loss of anchorage dependence and subsequent capacity of the transformed cells to form colonies in soft agar medium. This test can allow to detect a conversion from normal to malignant phenotype. For each test a positive and a negative control are included. The method is carried out according to European Pharmacopeia (7 edition). Cell cultures can display the capacity to induce tumors in athymic mice. It has been reported that the anchorage independence of a cell culture is not always associated with the capacity to form tumors. According to that, the tumorigenic features of a cell culture must be evaluated by the in vivo test that is carried out according to the European Pharmacopeia (7 edition). One of the characteristics of mesenchymal stromal cells is their capacity to differentiate towards different cell lineages such as adipogenic, osteogenic and chondrogenic lineages. This characteristic may be impaired by genetic mutations with consequent loss of their differentiation capacity. The test is performed on MSC amplified in vitro and cultivated in media containing factors able to stimulate differentiation. EBV immortalized B lymphocytes are an important source of biological material and of genomic DNA. These EBV cell lines are largely used in molecular and genetic research and their banking is of great importance in providing reference samples from patients with rare genetic diseases. The procedures used to obtain EBV transformed B cell lines have been widely standardized. They are based on isolation of peripheral blood lymphocytes from a sample and treatment with EBV collected from supernatant of B 95.8 marmoset lymphoblastoid cell line (cell culture bank www.ibvr.org). 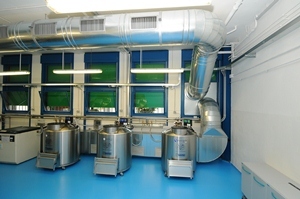 The methods developed at IZSLER Chemistry laboratory in Bolognas allow to identify antibiotic residues in food obtained from animals that have received a veterinary drug. The matrix is processed and the extract is submitted to instrumental analyzes by quantitative determination. The methods used are: Enzyme Linked Immunosorbent Assay- ELISA,; High-Performance Liquid Chromatography - HPLC; Liquid Chromatography.Tandem Mass Spectometry - LC-MS/MS. For honey and hive product samples the active substances residues that can be detected are the following: Sulfonamides, Tetracycline, Tylosin, Streptomycin. The laboratory is equipped with the most advanced instruments like: a gas-chromatograph coupled with mass spectrometer (GC-HRMS) for quantitative determination of polychlorinated dibenzo-p-dioxin and polychlorinated dibenzofuran (PCDD/F), PCB-DL (dioxin-lik) and PCB-NDL (non dioxin- like). The laboratory also performs quantitative determinations (ICP/MS) of heavy metals (sodium, magnesium, potassium, calcium, chromium, manganese, iron, nickel, copper, zinc, arsenic, selenium, molybdenum, cadmium, tin, mercury, lead). It also carries out analysis for the detection of Perfluorinated alkylated Substances (PFAS: perfluoroesanoic acid, perfluoroeptanoic acid, perfluorooctanoic acid, perfluorononanoic acid, perfluorodecanoic acid, perfluoroundecanoic acid, perfluorododecanoic acid, perfluorobutanesulphonic acid, perfluoroesansolfonic acid, perfluoroottansolfonic acid) by inductively coupled plasma mass spectrometry( LC-MS/MS). The laboratory can identify most of the toxic substances in animal tissues and in vegetables. Some of these may be grouped into specific classes. Isolation of chlamydial species is carried out on cell culture. Identification of the species belonging to the Chlamydia family is carried out by molecular tests, i.e. real-time PCR and PCR-RFLP analysis, which amplify specific genome sequences. The identification of new chlamydial species not yet classified is even performed by new real-time PCR and sequencing of specific genes. The identification of bacterial / fungal strains is carried out either by phenotypic or genotypic tests. The former consist in microscopic observation and isolation in specific culture media. Identification is made by biochemical tests that are performed by using commercial tests like the “API” or the” Vitek” systems. Genotypic tests, mainly PCR, are carried out to detect genes of virulence. Moreover, the 16S rDNA gene sequence analysis can be used to confirm the bacterial species. The identification of parasites is carried out by either phenotypic or genotypic tests. The former consists in microscopic observation and comparison with identification keys. Genotypic tests, mainly PCR, are carried out to identify genus or species. The identification of prototheca algae, species and eventually sub-species, is currently carried out by microscopic examination, growth in specific culture media and molecular assays (HMR-PCR, PCR end point or sequencing). Please note that for commercial purposes, the prices will vary according to previous formal agreements. Virus detection and identification can be carried out by several methods mainly based on serology tests by using monoclonal antibodies, Real time Polymerase Chain Reaction (rt PCR) and PCR which amplifies specific viral genome sequences known to be characteristics of a virus whose nucleotide sequence is available in data base collections. Contamination of a virus by other viruses can be checked by tests based on molecular biology assays that allow to detect viral DNA and RNA of other viruses that could be present in the biological materials or as virological contaminants during the virus isolation. Mycoplasma contamination can be detected by real time PCR method. Bacterial contaminations will be determined by inoculation of nonselective culture media. In addition, EM facilities are available for viral detection and identification by using negative staining methods. Such “catch all” methods (able to detect even non suspected/unknown viruses) take advantage from “Airfuge” ultracentrifugation that increase sensitivity to the detection level 103-103 particles/m. Indeed immune-electron-microscopy methods (IEM and IEM-gold) based on the use of hyper-immune sera and/or Monoclonal antibodies may help viral identification and classification.